The 2017 Screen Actors Guild (SAG) Awards seemed to have it all. There was comedy, speeches of appreciation, and politics. Luckily, the politics didn’t overshadow an incredible night as actors were honored for their work on some our favorite television programming. Here is a breakdown of this year’s SAG television nods and awards. Paid premium channels HBO and Showtime took this year’s SAG awards drama categories by storm. Bryan Cranston took home the award for best male actor in a TV movie or miniseries for his role as Lyndon B. Johnson in All the Way. Sarah Paulson, of American Horror Story fame, was given the same award for her part in The People v OJ Simpson: American Crime Story. Game of Thrones’ Peter Dinklage was nominated for best male actor in a TV drama series alongside Sterling K. Brown for This Is Us and Rami Malek in Mr Robot. Thandie Newton was nominated for her portrayal of Maeve Millay in HBOs reimagining of Micheal Chichton’s 1973 film, Westworld, for best female actor in a TV drama series. The casts of Game of Thrones and Westworld were also honored with nominations. Modern television producers understand comedy and several series have risen the bar. Best known for her role as Elaine in the smash sitcom, Seinfeld, Julia Louis-Dreyfus received the award for best female actor in the TV comedy series Veep. Showtime’s seven season breakout hit Shameless helped William H Macy win for best male actor in the same category. ABC and NBC apparently ruled the airwaves last year and each received nominations for best cast in a TV comedy series. With a cast that includes Kaley Cuoco, Johnny Galecki and Jim Parsons, The Big Bang Theory was nominated next to Black-ish and Modern Family. However, in the end, it was Netflix that aired the best cast of 2017. This year, Netflix has proven itself as a force to be reckoned with as it took home SAG nominations and awards in both the comedy and drama categories. Gaten Matarazzo jumped for joy when he and his fellow Stranger Things castmates were awarded for having the best dramatic cast. The Crown brought Claire Foy a win for best female actor in a television drama. Also from Netflix, Orange is the New Black received a nomination for best female actor and a win for best cast in a comedy series. Grace and Frankie’s Jane Fonda and Lily Tomlin were both nominated for their TV comedy roles. 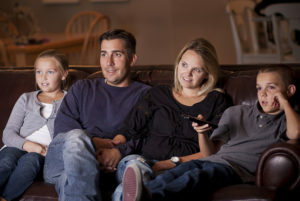 Fortunately for viewers, many cable providers now offer home television and internet bundling deals which can only heighten the presence of streaming services on the television series scene. Quality television is still present in this day and age. From the blockbuster budgets of paid premium channels to streaming services and traditional networks television programming shows no signs of slowing down. People are still watching and the SAG awards will continue to honor the hard work of the actors involved with them.